Well, I do not have the forthcoming Windows, Windows Vista (previously named Longhorn), to try out, but CoolTechZone.com is kind enough to do a review of the new version of Windows. Just in case you are curious about it, this review at least gives you the first impression on Windows Vista. Booting process – you know, right from the black colour screen before Windows is actually loaded. Graphics Device Interface – How Windows Vista create graphics on display. Virtual Folders – One of the hottest features we have been waiting to have a look. The Desktop – The first glimpse of the new Windows OS. Start Menu – The famous “Start” button that you are so familiar with. Windows Explorer – Not Internet Explorer, Windows Explorer is explorer that showing you your files directory tree and folder contents. Internet Explorer – The beta version of Internet Explorer 7 has been embedded into Windows Vista Beta 1. Well, I might be a few hours late to blog about this news, but it’s still worth writing. Google has finally ended the speculation of acquiring youtube.com, which already been raised over and over again for the past few months. Seeing youtube is already serving more than 100 million videos everyday, Google decided to be the leader of online video hosting service in a quick way – by acquiring youtube.com for USD$1.65 Billion! In other words, in this purchase Google has beaten the potential buyers included Yahoo and Microsoft Corp. and media giants News Corp., owner of MySpace.com, and MTV owner Viacom Inc. I just came across this special Linux distribution that can be installed on the iPod, and thought I should share it with you all. You might not be aware of this small system, which can perform quite a few interesting functionalities such as audio recording, photo viewing, calculator & calendar, Tetris game, Asteroids game and the most recent feature : Playing movies !! It’s been a long time I didn’t update this blog. I’m so so sorry about that. Anyway, I’m back to blogging and again come back with a good news to all webmasters. Google is updating its PageRank (PR) at the moment throughout all its datacenters around the globe. In case you are concerning about the PageRank of your websites, you might wanna check out this tool from SEOLog. If you see any difference among the PRs shown in all datacenters, your website might have a new PR soon. Please note that not all datacenters updated the PR, that’s why you’ll see different numbers (if there is any changes of your PR). To those who will be having higher PR, congratulations! Sorry for those who might be dropping some PR. Don’t be too sad, instead work on it and I’m sure you’ll have good result for the next PR update. Until I clear all 2,197 spam comments, I will be back blogging frequently again! 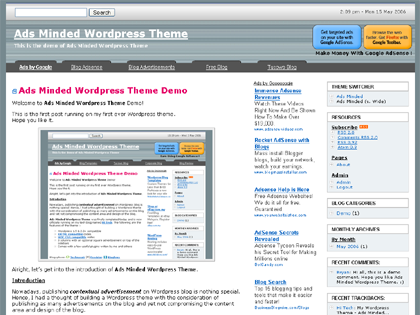 After 10 days since I released my first WordPress theme named Ads Minded on May 4, 2005, here comes the wide version of the theme. The main difference between the normal version and wide version is the width. The normal one is having the width of 770px whereas the wide version will have a width of 1000px. This version suits you if most of your blog readers are using screen resolution larger than 1024 x 768. Finally I completed my first ever WordPress theme. 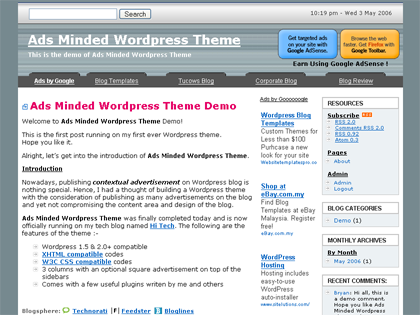 Alright, let’s get into the introduction of Ads Minded WordPress Theme. Nowadays, publishing contextual advertisement (such as Google AdSense) on WordPress blog is nothing special. Hence, I had a thought of building a WordPress theme with the consideration of publishing as many advertisements on the blog and yet not compromising the content area and design of the blog.